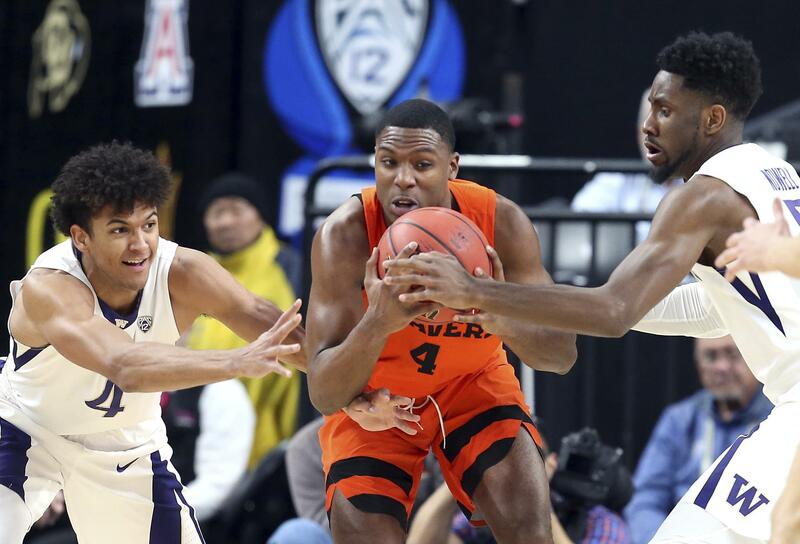 Wed., March 7, 2018, 8:59 p.m.
LAS VEGAS – Drew Eubanks scored 19 points, Stephen Thompson Jr. added 14 and Oregon State outlasted Washington 69-66 in overtime on Wednesday night in the opening round of the Pac-12 Tournament. Oregon State went up 66-64 in overtime on Tres Tinkle’s two free throws. Washington tried to set up a shot to tie, but David Crisp threw the ball out of bounds. Eubanks hit 1 of 2 free throws and Crisp scored on a layup with 3.1 seconds left to pull the Huskies within two. Tinkle hit two more free throws with 2.5 seconds left and Crisp got a good look at a tying 3-pointer, but it caromed off the back of the rim. Oregon State (16-15) moves on to face No. 2 seed Southern California in the quarterfinals on Thursday. Matisse Thybulle had 19 points and Noah Dickerson 15 points as Washington (20-12) saw its slim NCAA Tournament hopes disappear. Washington made a strong NCAA Tournament push with consecutive wins over Arizona and Arizona State in early February. But the Huskies fell away from the NCAA bubble with a stretch of four losses in five games, including a double-overtime setback at Oregon State. Washington won two of its final three games, but needed a strong run in the Pac-12 Tournament to have any NCAA shot. The third meeting of the season became a defensive battle, neither team able to find much operating room. Oregon State made 8 of 23 shots in the first half, including 1 for 7 from the 3-point arc. Washington was slightly better, going 11 for 29 and 2 for 9 from 3 to lead 29-25. Halftime adjustments freed up both offenses early before the defenses controlled the game again. Oregon State went nearly 6 minutes without scoring, but Washington couldn’t stretch its lead. Then the Huskies had a stretch when they went 1 for 9 and the Beavers capitalized, going on a 10-2 run to go up 55-51. Published: March 7, 2018, 8:59 p.m.